Celebrate the most important day of your life on board one of Norwegian Cruise Line's wonderful ships bound for paradise in the Bahamas, Caribbean, Bermuda, Hawaii, Alaska or Europe. Every detail from the day you schedule your wedding to your ceremony and champagne toast will be handled for you. We've thought of everything, so you can enjoy your big day. Wherever you choose to say, "I do," we will make sure you do it in style. 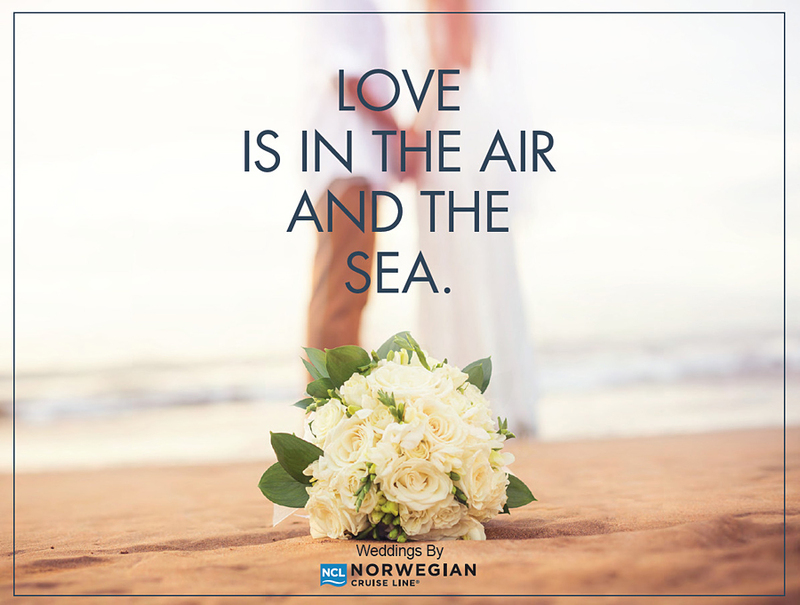 Whether you want to exchange vows or vow to do it all over again, your wedding plans are a piece of cake with Norwegian Cruise Line's Wedding Planner. Choose to celebrate your special day with just the two of you, or together with family and friends, followed by a romantic reception package. With Norwegian Cruise Line the choice is yours. For additional information on, availability and package pricing, of Wedding Packages only, please contact Royal Ocean Events from 8:00 am to 4:00 pm PST Monday through Friday or call toll free: 1.888.475.5511, direct: 604.940.1181, or email us at ncl@royalwed.com.